Bourbon is a decadent alcohol that pairs exceptionally with chocolate, so it's no wonder this Bourbon Truffle flavored coffee will tempt any chocolate lover. 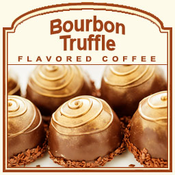 With the essence of Kentucky bourbon and chocolate truffles � made with the smooth flavor of ganache, this 100% authentic Arabica gourmet flavored coffee creation will tantalize your taste buds with its silky taste that lingers subtly of bourbon, sweet vanilla, and rich, hot fudge. Although this Bourbon Truffle flavored coffee is full of flavor, it only has 2 calories in each cup of this dreamy collaboration of sweet sapors. Roasted and shipped on the same day, this flavored coffee is melt-in-your-mouth delicious. Packaged in a heat-sealed valve bag, your Bourbon Truffle coffee will be fresh with its lively, rich-chocolaty decadence. Give into temptation with this full-flavored, creamy coffee!